Grisi Sulfur Bar Soap is good for Acne Treatment. It's safe with natural ingredients, fully recommended to treat zits, pimples and blackheads as well as reducing oil on the skin. Grisi Sulfur soap with Lanolin reduces excess dryness and skin scaling. It's also excellent for scabies and lice. 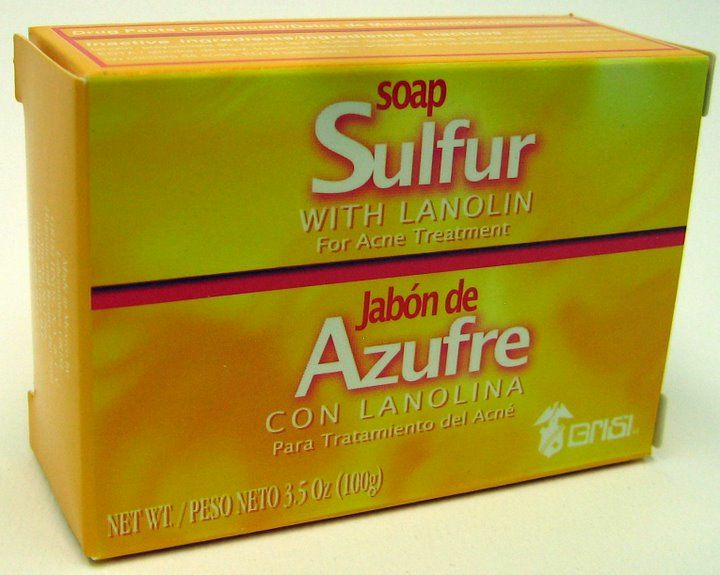 Use Grisi Sulfur soap twice daily to get rid of oily skin, not allowing pimples to appear. 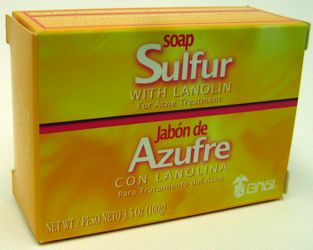 Jabon de Azufre con Lanolina para tratamiento del Acne. Asufre. La Barra de jabon Grisi Azufre con Lanolina es un excelente jabon antibacterial para el tratamiendo de Acne. Es seguro con ingredientes naturales, totalmente recomendable para tratar barros, espinillas y puntos negros, asi como la reduccion de aceite en la piel. Grisi Azufre con Lanolina reduce el exceso de sequedad y descamacion de piel. Tambien es excelente para eliminar manchas y espinillas de acne, sarna y piojos. Use la barra de Jabon Grisi Azufre con Lanolina dos veces al dia para deshacerse de piel grasosa y no permite que las espinillas aparezcan nuevamente. Si funciona y muy bien para quitar el acne y cuidar que la cara se vea sana y limpia. Grisi vende este producto con exito desde hace mucho tiempo. I love this soap. it is comparable to all the other more expensive sulfur soaps. After an intense yoga workout it's good to shower with a soap that helps prevent against athletes foot and is great for removing dirt and oils from the pores. I would recommend it for acne as well as once I started using it all my blemishes disappeared. Just don't use it every day. Sulfur can be drying and although the soap contains lanolin I would recommend a moisturizer. Good for skin conditions. Once again, as others have said, use a moisturiser afterwards...Only wish it was a little thicker bar of soap. Scent is mild. my husband and I have been using this soap for a couple of years now; a friend who had acne recommended it. We use it on the face to keep it clear from breakouts and it works like a charm! It has antimicrobial properties. It dries the skin a little so moisturizer after it's use is recommended for the ones with sensitive skin especially during winter time. The downside is it's smell since the sulfur is detectable but moisturizer does the trick for me and after shave does it for my husband. Time after time, we keep buying it!